1. Melt the honey and almond butter together in a microwave-safe bowl for 30 seconds. Stir, and microwave for an additional 30 seconds. 2. Add protein powder, oats and glucomannan fiber and mix well. Dough should be thick and sticky. If it is not, add water one tablespoon at a time until it reaches the appropriate consistency. 3. Mix in the dried blueberries and cranberries. 4. Press mixture into a parchment paper lined 9x7 baking pan. 5. In a small pan, lightly toast the sliced almonds and coconut. This will only take a few minutes over low heat, so keep an eye on it! 6. Top the dough mixture with the almonds and coconut, using your hands to press the mixtures together. 7. 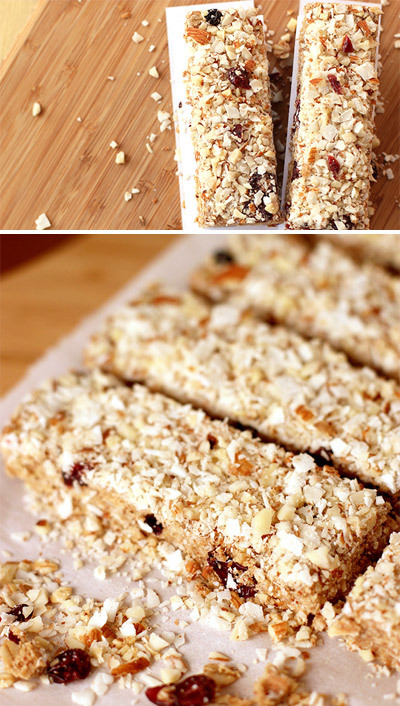 Cool in the refrigerator for one hour before cutting into bars.